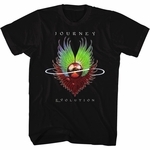 This black tee features Journey's eighth studio album: Frontiers. ormed in 1973 by former members of Santana, Gregg Rolie and Neal Schon, Journey is a rock band based in San Francisco, California. After years of struggling as a prog rock backing band, they decided to hire a more mainstream vocalist to increase their chances of success. 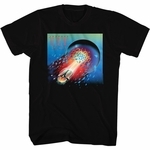 When Steve Perry came on as frontman, the band started producing hits: best known for soaring arena rock anthems like "Don�t Stop Believin�" and power ballads like "Open Arms," Journey had over a decade of victories before acrimony within the band broke them up. Today, Journey continues to tour and record with Perry sound-alike vocalist Arnel Pineda.